So it’s Monday again… At least today we have rainbow manicures to brighten up the Monday blues a little! Yay it’s so bright and colourful! 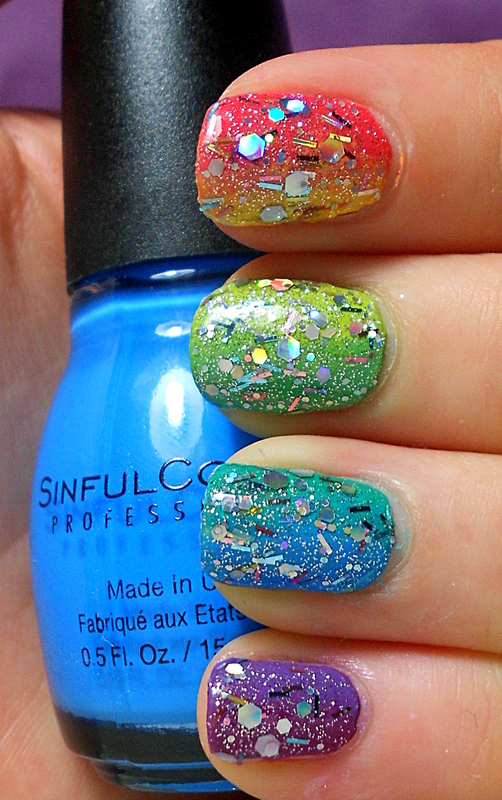 This was a fun and colourful mani, and I used by far the most polishes I have ever used for a single manicure… I created a vertical gradient with 2 colours on each finger, and then topped it off with 2 different glitters. 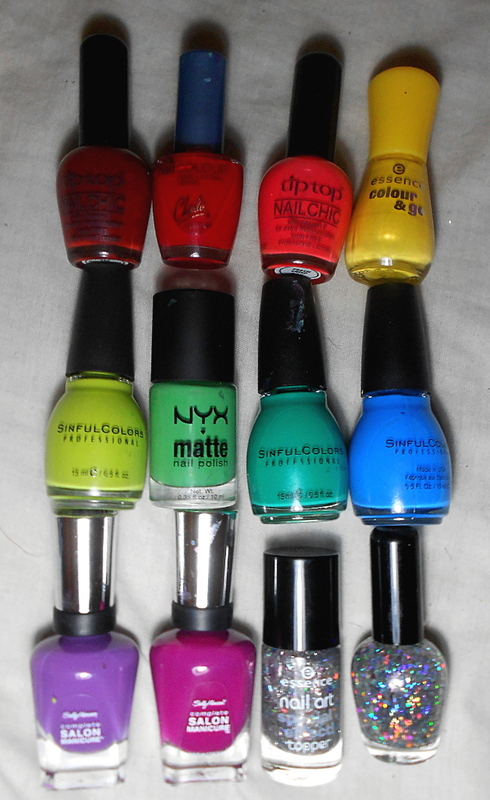 Starting from my thumb, the polishes I used were: Tip Top Nail Chic – Red Rendezvous; Charlie Revlon – Lady in Red; Tip Top Nail Chic – Peach Crisp; Essence Colour & Go – Wanna be your Sunshine; Sinful Colors – Rise and Shine; Sinful Colors – Fly Away; Sally Hansen Complete Salon Manicure – Good to Grape; Sally Hansen Complete Salon Manicure – Cherry, Cherry, Bang, Bang! ; and the 2 glitter toppers were Essence nail art Special effect! Topper – Glitter on Me and Tip Top Nail Chic – Rocky Road Glitter. Glitter on Me contains small silver glitters along with holographic bar glitters. 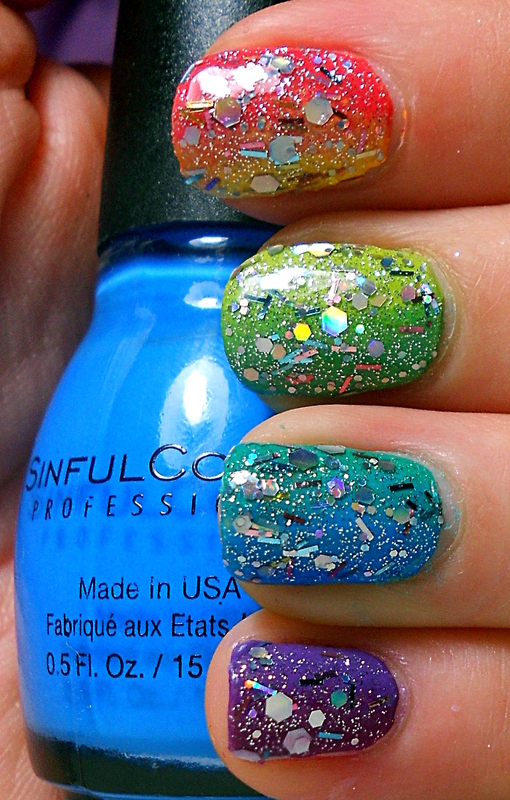 Since holographic glitters shine in all the colours of the rainbow, I thought it was pretty appropriate! Rocky Road Glitter is different sized hex holographic glitters, and it’s one of my favourite glitter toppers EVER. It’s just beautiful. 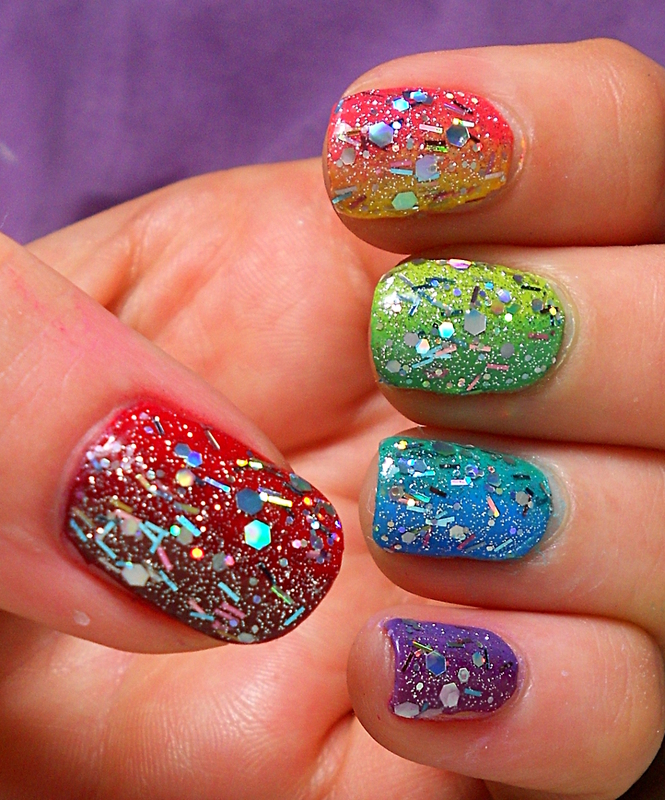 What do you think of today’s rainbow manicure? 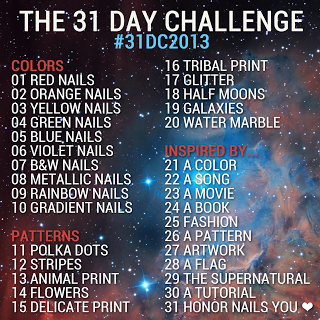 Tomorrow’s theme is gradient nails, be sure to come take a look! WOW!!!!!! so colourful and gorgeous! i love this! 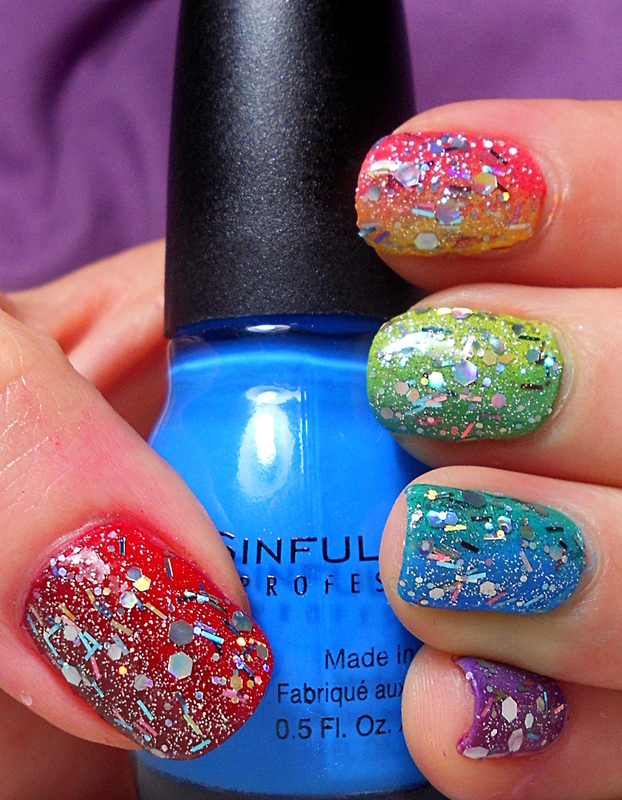 Wow that’s a lot of different polishes on your nails – but the end result is stunning! I love it! I’m in love with these type of gradients. They’re just perfection!